It is indisputable that human-computer interaction plays a vital role for Visual Analytics tasks. In the last decade, a plethora of novel and more natural ways of interacting with computers has been introduced in research and industry. However, their full potential for visual analysis has not been unleashed yet. The talk wants to emphasize the importance of the yet underexplored interaction side of visual analytics. People shall be empowered by effective, intuitive and rewarding interfaces for problem-solving and sense-making activities. To illustrate this point, we will showcase examples from our own research, including multimodal interaction with visualization lenses, spatially-aware tangible displays for navigating visualization views, and body-centered data exploration at large display walls. Strengths and weaknesses of diverse interface technologies will be discussed for typical analysis tasks. It will be argued that people can greatly benefit from gestural and body-centered interaction for sense-making activities. We will also contemplate novel device environments, such as large high-resolution displays, multi-display environments as well as Augmented Reality setups, thereby reflecting on aspects like the collaboration of analysts and the novel trend of Immersive Analytics. Raimund Dachselt is head of the Interactive Media Lab at the Technische Universität Dresden, one of Germany’s Universities of Excellence. He studied Computer Science and Design Informatics in Dresden, Glasgow and Halle. Raimund holds a PhD in Computer Science from Technische Universität Dresden. Starting in 2007, he was working as a professor for User Interface & Software Engineering at the Otto-von-Guericke-University Magdeburg. In 2012, Raimund was appointed full professor at the Faculty of Computer Science at TU Dresden. His main research areas are natural Human-Computer Interaction and interactive Information Visualization. Raimund and his group contributed novel ways of working with interactive surfaces like tabletops, tablets, or display walls using various interaction modalities, among them multitouch, pen, gaze, tangibles, hand and body gestures. On the visualization side, contributions include graph exploration and manipulation techniques using Natural User Interfaces as well as mobile visualization and immersive analysis approaches. 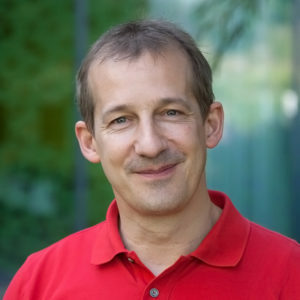 Raimund has co-chaired several international workshops and conferences and is a member of the ACM ISS steering committee. He published more than 160 peer-reviewed contributions, won several best paper awards, and is co-author of the most comprehensive German textbook on Human-Computer Interaction.